The feast always falls in Lent, a period in which traditionally people fast or give up sweet things. So, it’s always been a welcome excuse to forget the fasting for a day and to eat special sweets to celebrate Father’s Day and San Giuseppe. These sweets come in many shapes, sizes, and flavours and are often called zeppole, a corruption of the name Giuseppe. In Catania, Sicily, the specialities for San Giuseppe are known as crispelle di riso (or crispeddi in Sicilian dialect) in the city and zeppole in the rest of the province of Catania. They are made from rice, flour, and yeast and are flavoured with orange and cinnamon. Like most Sicilian sweets, they are deep fried in oil and then they are bathed in honey. The result are sweet, crispy little fingers which are delicious at any time of the day. The cooked rice with the orange zest and cinammon. Did I mention where they are from? I first had these in Catania a few weeks ago (they start early) and then researched several versions of the recipe to come up with my version below. These are almost identical to the ones I had in Catania. A few notes on the recipe: shaping the crispeddi can be tricky as the mixture is very sticky. However, coating your hands in flour and rolling the crispeddi in more flour with the palm of your hand will do the trick. I’ve seen some recipes where the dough is cut into strips which are then hoiked up with the knife and dropped into the oil with a flick of the wrist. This is probably impressive to watch but sounds like a recipe for having your kitchen splattered with dough and you getting splashed with boiling oil. My method also gives more regular shapes. You need to fry these as gently as possible, because some of the flour will wash off into the oil and could start to burn at the bottom of the pan. I therefore use peanut oil since it has a very high smoke point. If you are worried about allergies, you can use any other kind of vegetable oil but be careful because most have lower smoke points and the flour will burn more easily. You can use any rice but Italian short grain or risotto rice works best as it absorbs liquids easily. I used Vialone Nano rice for the ones in the pictures. 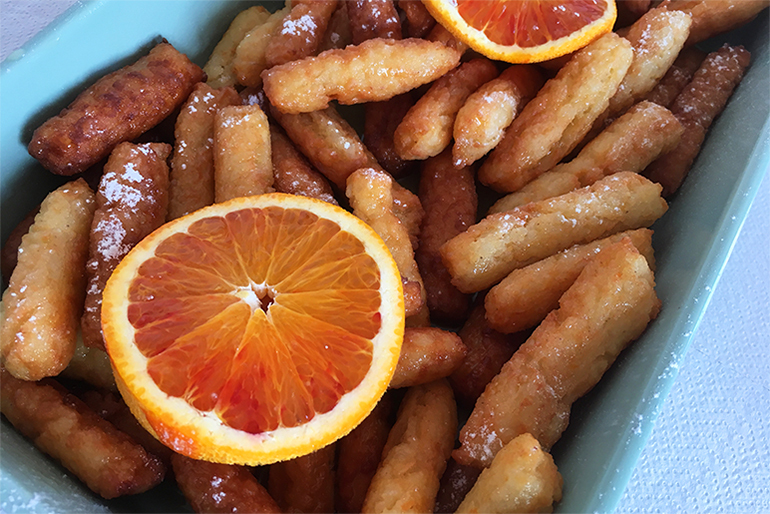 So, enjoy these crispeddi and have a great Festa del Papà! Put the rice, milk, and salt in a saucepan. Bring it to the boil and then cook gently until the rice is a sticky mass and all the milk has been absorbed, about 15 minutes. Remove from the heat and add the orange zest, cinnamon, sugar, and yeast dissolved in a little warm water. Mix to combine. Sift the flour over the top of the mixture, combine with a wooden spoon and then bring together with your hands to form a kind of dough. Cover with a clean cloth and leave to rise in a warm place for at least an hour. Roll the mixture out onto a floured surface until it’s about a centimetre (1 inch) thick. Cut the mixture into strips of about one centimetre (1/2 inch) width and four centimetres (2 inches) in length. Roll the crispeddi in flour with the palm of your hand. Place the oil in a deep frying pan or skillet and heat gently until bubbles begin to rise. Fry the crispeddi in batches until they are golden brown, about 6 minutes. Then drain them on pieces of kitchen towel and leave to cool. Place the crispeddi in a dish. Then melt the honey in a saucepan with a couple of tablespoons of water. Pour over the crispeddi and allow to cool. Douse with icing sugar and serve. Oops! There was a glitch with the software. The recipe is there now! Thanks for noticing. Happy St. Joseph’s Day! I have never seen zeppole like these. If this link works, this is what we have in Chicagoland. They are more like doughnuts and have a custard or flavored filling (no rice). Years ago I recall they were sold only on March 19 and if you wanted a quantity of them you had to pre-order. I think I’ve also seen round ones—maybe at a St. Joseph table. I had not thought about zeppole being from giuseppe, but it makes sense!